Create presentations that include images, videos, transitions, and animations. Get to your presentations from your computer, tablet, or phone. If you're using the desktop version of PowerPoint on a Windows PC, see the PowerPoint Quick Start. If you're using the desktop version of PowerPoint on a Mac, see Office for Mac Quick Start Guides and PowerPoint for Mac Help. 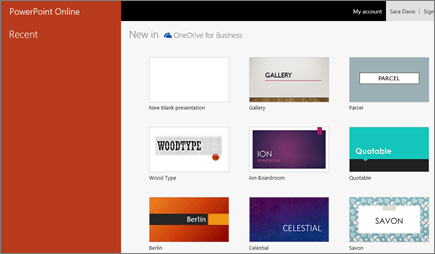 Select the Office 365 App Launcher , and then select PowerPoint. Select New blank presentation, open a Recent file, or select one of the templates. Your changes are automatically saved in PowerPoint Online.